AirAid SynthaMax Jr. Air Intake 13-19 Ram HD 6.7L Diesel [AirAid 301-786 Intake System] - $411.95 : 3rd Strike Performance, Your Source for Late Model MOPAR Performance Parts and Accessories! AirAid SynthaMax Jr. intake kits target the restrictive elements of factory intake systems, the intake tube and the paper filter, to boost horsepower and mileage. 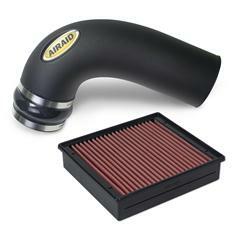 These air intake kits feature AirAid dry SynthaMax Direct Fit Premium replacement filters and modular intake tubes. As with other AirAid intake systems, AirAid Jr. kits help straighten and improve clean air flow to the engine for added throttle response with increased horsepower and torque. Each kit is custom-built to fit specific vehicles, is easy-to-install and requires no drilling. Unlike stock paper filters, SynthaMax Direct Fit Premium filters are washable, reusable, and fully backed by the AirAid no-hassle lifetime warranty.